The story of Judith is full of danger and violence counterpointed by fidelity and great rejoicing. Today we discover that despite grave danger, joy is present. If today’s story calls you to search for more surprises, click on the word Joy in the categories cloud in the blog’s right hand sidebar and choose a reflection, or enter the word Joy in the blog search bar. You may also want to visit the Joy for the Journey blog at www.joyforthee.blogspot.com to see how joy surprises you there. Today we find joy in miraculous deliverance. 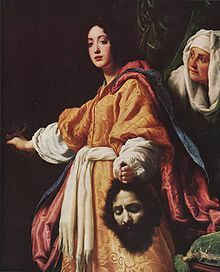 Judith’s story is not included in all versions of the Bible because it is regarded by some to be an historical novel rather than sacred word. Others see is as a kind of allegory in that the name Judith is the feminine form of the word Judah. Still others point to anachronisms and decline to regard these words as inspired. In any case, the story holds is one of consequence, and one in which we see God’s deliverance of the faithful from the most extreme of circumstances. It is a story to which we will want to attend. If you did not have time to read the introductory chapters, move through them today – if even only quickly. The opening pages of the book prepare us for the dreadful middle and the joyful end. They put us in a time and place we will recognize as much like our own. They will give us a firmer footing from which to view this story, a stronger reason to hope as Judith does, and a clearer image of the desperation and joy she experiences. Verse 14:9: When she had finished her story, the people cheered so loudly that the whole town echoed with sounds of joy. Is there a Judith among us who quietly moves forward through God’s plan and surprises us with an outrageous act of hope? Are we the unobtrusive Judith or almost unseen handmaiden who turns history on its head in a surprising way? And when God intervenes with and in us in such startling ways, do we recognize the presence of the Spirit in our hour of desperation? Do we recognize the Judiths among us and if so, do we value their quiet persistence and determination? Do we perhaps see ourselves in the gritty and resolute actions of these women? And when God intervenes with and in us in such surprising ways, do we give thanks and honor to the Living God who is in and with all who find joy in great peril and outrageous deliverance? 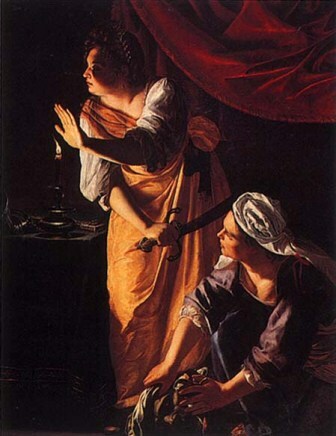 For more details and insights about the encounters between Judith and Holofernes, visit other Noontime reflections by entering the word Judith into the blog search bar. The story of Judith is full of danger and violence counterpointed by fidelity and great rejoicing. Today and tomorrow we discover that despite grave danger, joy is present. If today’s story calls you to search for more surprises, click on the word Joy in the categories cloud in the blog’s right hand sidebar and choose a reflection, or enter the word Joy in the blog search bar. You may also want to visit the Joy for the Journey blog at www.joyforthee.blogspot.com to see how joy surprises you there. Today we find joy in great peril. The opening chapters of Judith’s story set a scene of violence, intrigue and power. War begins. An ultimate is delivered. An enemy is defeated and a council takes place to assess plans and possibilities. 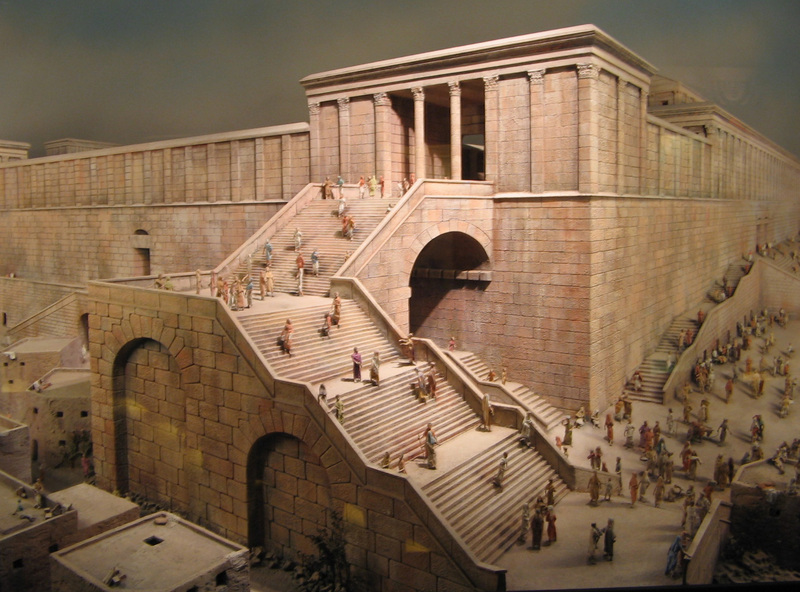 Nineveh and Ecbatana are now at the center of this drama, but Nebuchadnezzar rages against more than Persia. He lays out a secret plan to take revenge on the entire world, and once these plans are complete he sends for his general Holofernes. These events bring forth images from our daily newscasts that we might recognize in our modern world. Who would suspect that the town of Bethulia and the little-known widow, Judith, would turn the Assyrian power structure on its head? How might each of us, in our own infinitesimal way, have an effect upon the wider world? How might each of us find joy amid the peril that surrounds us? Verse 10:3: She took off the sackcloth and her widow’s clothes . . . Judith turns away from her inner grief and turns outward to the world. So might we. She took a bath, and put on rich perfumes . . . Judith enters into an intentional plan brought forward through prayer. So might we. She brushed her hair, tied a ribbon around it . . . Judith prepares herself as herself and not as another entity with grandiose ideas. So might we. She dressed herself in the fine clothes she used to wear on joyful occasions when her husband Manasseh was still alive . . . Judith moves forward in the only way she knows how. In fidelity. In trust. In faith. In hope. So might we. In Chapter 9 we find The Prayer of Judith, beautiful, honest verses of petition from one who is so small against gargantuan obstacles. If we spend some time with these words today, we might better understand how Judith calls forth the joy she had once known to find joy in great peril. For more Noontime reflections about this woman’s story, enter the word Judith into the blog search bar and explore. Evening, morning and noon I will cry out in my distress, and God will hear my voice. Like Judith and her maid who were accustomed to going out of the enemy camp at regular prayer intervals, we will escape the traps that await us. Even more than this, in our regular communication with God we become conduits of God’s action on earth. God says: I know how busy your days and nights are. Do I not see all? Did I not create you? It brings me joy to be with you in prayer and it matters not if you bring me your sorrows or your joys. All that matters to me is that you arrive in the evening, in the morning and at noon. I do not ask that you neglect your work or your loved ones. I ask that you pause and think of me, speak to, pray with me for even the briefest of moments. I am always with you . . . but your prayer delights me . . . and I long to hear your voice. God created Jesus as God’s Word and it is clear from this creation that communication is paramount to God. Can we imagine a life lived in such constancy to God? Can we imagine a life without God at all? Let us consider how we might pause if only for a moment in the morning when we rise, at noon as we traverse our day, and in the evening as we lay our head on the pillow. In this way we place ourselves in God’s hands so that we might complete God’s work. For more information about Judith and her maid, enter the word Judith in the blog search bar and explore. As we continue our series of reflections on the nature of schemers and their plots, how to avoid them and how to rebuke those who lie on couches to conspire, we return to the story of Judith. Holofernes is a man accustomed to using power and he also knows how to bide his time, lay traps, and bring others into his schemes. What he has never encountered in his powerful life is a woman who is as beautiful, God-centered, and determined as Judith. And Holofernes’ lust is no match for Judith’s constant, prayerful attendance on God. This story is worth reading from beginning to end but if there is time for only one verse, it is 12:16 for it teaches us how to deal with schemers, seducers and plot-builders. The story of Judith is full of the detail which we might overlook if we rush through the reading; and it is the kind of detail that a good writer uses to describe the depth of one’s personality, the reason for one’s perversion, the cause of one’s sociopathy. It is the kind of writing which brings us up sharply when we experience the shuddering reality that human beings often spend more time trying to lure others into a personal agenda than they do honestly working at the task God assigned to them. The image of this man “burning with desire . . . yet biding his time” is one that haunts me. I cannot shake it. And it returns in the written word on a day like most others . . . packed with activity . . . with so little time for reflection about what is real and not real. And so we hear this story which has been retold so many times through history and in so many ways. It is a story that teaches us how to combat the lavish allure of the banquets staged by those who plot against innocents and of a woman who answers God’s call with the only tools left to her. It is a story rife with irony and inversion. It is a story of how God moves in our lives if we but allow God to enter. 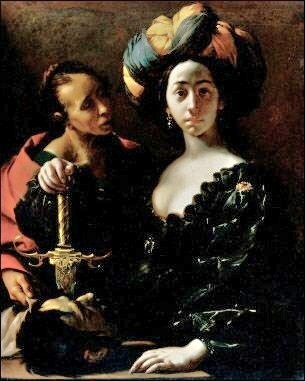 May we all take a lesson from Judith. To read more Noontimes reflections on Judith, enter her name in the blog search bar, seek . . . and find. Senior, Donald, ed. THE CATHOLIC STUDY BIBLE. New York, Oxford University Press, 1990.RG 213. Print. Adapted from a Noontime first written on October 3, 2007.